Breakfast smoothie recipes are intended to make breakfast easy and at the same time making sure you get the necessary nutritious foods your body needs to function properly during the day. Breakfast is after all the most important meal of the day. Breakfast smoothies are the most simplistic and quickest way of getting that vital fruit into your body first thing in the morning to get your metabolism going. Not only is this a great and healthy way to start your day, a breakfast smoothie has enough energy to last for many hours often until lunchtime before you get hungry again. This is of course not to say you cannot enjoy a breakfast smoothie at any time of the day. 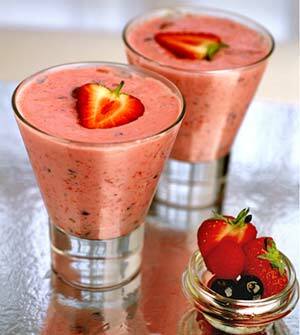 Our breakfast smoothie recipes contain plenty of fruits and we make suggestions on what fruit to use. But, make sure to experiment by using different kinds of fruit. Oranges, bananas, strawberries and apples work well and so does grapes, peaches and mangos. Our breakfast smoothies generally contain muesli or granola and egg too. Although these ingredients add a lot of protein, feel free to experiment by leaving them out if you are in the mood for something lighter. If you are new to smoothie making, we suggest that you read our useful tips in the Smoothie Recipe Guide.